Mark Weinberger shares the principles that can help businesses thrive in the digital age. As you read this article, you’re one of over 3 billion people connected to the internet right now. That’s nearly half of the people on Earth. Some of these people are shopping, catching up with friends, or, like you, reading this. Others are managing global supply chains, responding to customer service requests, or building an app that’s going to change the world. As a CEO, I know that all of these people are doing something else, too: they’re changing the business world as we know it. For businesses and governments around the world, the rapid integration of digital in business has opened enormous opportunities. But this digital era has also created challenges that didn’t even exist two decades ago. When I joined global leaders at the 2016 World Economic Forum’s annual meeting in Davos, these challenges were at the top of the agenda. For me, they come down to four principles to help guide our approach to the wider digital world. No matter what field you work in, they may be able to help guide you, too. Innovation is a challenge that often becomes more difficult with success. The bigger a company gets, the more day-to-day, short-term concerns arise. That means if you want to innovate, you ultimately need to disrupt your own business model while you’re making it work day-to-day. That’s tough – but it’s not impossible. We’ve found that asking people who run businesses to also lead digital innovation is unproductive. Instead, you need a separate group of individuals unbound by the organization’s short-term constraints and pressures to take on this long-term planning and strategy. That’s why at EY we created a global innovation group, and hired someone from the tech world to head the effort as our Chief Innovation Officer. Under his leadership, the group’s entire job is to think beyond short-term constraints to how we’ll need to do things differently in six months, three years, 10 years and beyond. One way they’ve done this is essentially setting up internal startups within some of our key practices. They recruit professionals from within our organization and the tech world to figure out how a business would disrupt this part of our work. Then, instead of waiting for that to happen to us, they begin making a plan for how we can disrupt ourselves. When computers first became a part of the business world, most companies responded by having someone set up a “digital strategy.” They would appoint a Chief Technology Officer to figure out the computer network, and then just forward that CTO all the digital issues or requests that came in. Today, that kind of digital compartmentalization doesn’t work. Everyone’s clients and customers spend a huge amount of their lives online – and they expect to be met where they are. Look at banks. In many ways, the business model for banking hasn’t changed in centuries. But even while the mission remains unchanged, the banking industry has had to dramatically rethink how to fulfill that mission in recent years. The U.S. Federal Reserve recently found that 39% of people with mobile phones are now using them to manage their banking. Most Millennials use a banking app at least a few times each week – and many of them once a day. Innovation like this even extends to industries that seem to have no connection to the new digital economy. 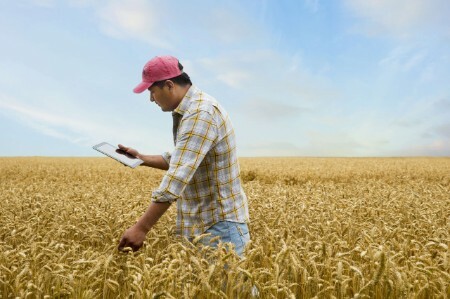 Agriculture, for example, is undergoing its own impressive technological evolution. Companies are now able to apply data analytics to farming, using soil and weather data to tell farmers exactly which seeds to plant, where to plant them, and even how to cultivate them for most success. Businesses fail to use about 80% of the customer data they collect right now. We hear a lot about “big data” today, but it’s important to remember that gathering data is just the first step. It’s crucial to turn those bits and bytes into actual knowledge you can use. That might sound obvious, but too often this crucial step is overlooked. In a recent survey of senior executives, we found that 81% of respondents agreed that data should be at the heart of decision-making – but only 31% said they had significantly restructured their operations to incorporate analytics. In fact, businesses fail to use about 80% of the customer data they collect right now. Many invest millions of dollars into gathering data, produce great insights on one side of the organization, but then don’t follow with a clear sense of how to turn that knowledge into actionable insights. To build a data-driven culture there must be someone in charge at the top. It’s not enough to just have an executive cover this as part of his or her portfolio. There needs to be a dedicated C-level leader. That’s why we have a Chief Analytics Officer whose entire mission is to incorporate analytics throughout our organization. If you’re a company that wants to bulk up your digital capabilities, do you train people internally? Do you partner with another organization? Or do you acquire another company that does what you need? The answer is different depending on the circumstances and the company. But increasingly, many companies are going for the third option – which is one of the reasons that mergers and acquisitions spiked last year, as more and more established businesses have acquired tech companies that can supplement their offerings. However, there is a lot to be said for the power in partnerships. In addition to the digital capacities we’re building internally, we’ve set up partnerships with companies like LinkedIn, IBM and Microsoft. This means that we can combine our strengths to improve our client offerings in areas like data analytics, security, and digital enterprise. Together, these four principles underline an essential reality for businesses today. The strategies that worked for the last 30 years – the same ones that drove many companies to the top - are the very qualities that could hold them back in the future. Fortunately, the very tools that have unleashed the threat of disruption also make it possible for businesses to adapt and evolve faster than ever. Technology may be the cause of many challenges today - but if we approach it right, it’s also the solution. This article was previously published on LinkedIn, February 2016, under the headline "Opportunity or Threat? Four Principles of Digital Disruption." No matter what business you’re in, knowing more about digital trends can help you stay competitive.